The open top version of the Alfa Romeo 4C has debuted at the Geneva Motor Show, going on from the 6th through the 16th of this month. Called the Alfa Romeo 4C Spider, the name spider is the traditional name of an open top car in Italy. The Alfa Romeo 4C Spider displayed at Geneva is a pre-production prototype, designed by the Centro Stile and hand-made by a team of highly specialized professionals. 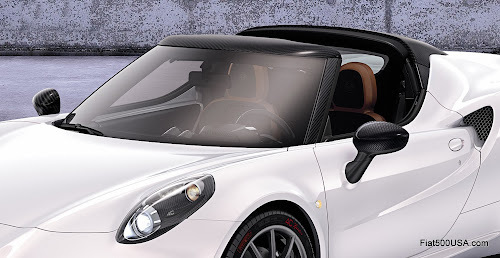 The new open top Alfa 4C is scheduled to be available in the first part of 2015. Watch the full Alfa Romeo press conference and unveilings of the Mito and Giulietta QV and 4C Spider! As with most convertible top cars, there is a weight gain as the chassis needs additional reinforcement to make up for the loss of rigidity when a roof is cut off. Fortunately the Alfa Romeo 4C is made almost entirely by exotic materials, with an immensely strong carbon fiber chassis, so the weight gain has been kept to a reasonable amount. 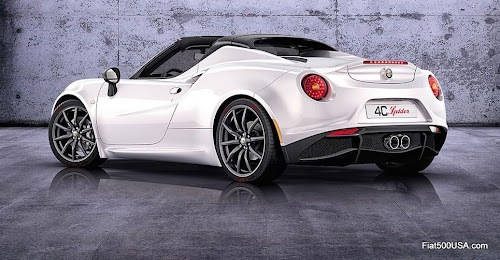 The new Alfa 4C Spider weighs in at less than 2,200 lbs. (1,000 kg,), or an estimated 225 lbs more than the hardtop version (1973 lbs or 895 Kg). An interesting technical detail is the rear window is replaced by a structure molded in SMC (Sheet Molding Compound) which houses the headrests and roll-bars. Low-density SMC, at just 1.5 g/cm³, is significantly lighter than steel (~7.8 g/cm³) and aluminum (~2.7 g/cm³), as well as being more malleable. According to Alfa Romeo, in contrast to aluminum, SMC does not deform in minor collisions, and is extremely resistant to chemical and atmospheric agents. It also disperses sound efficiently, increasing acoustic comfort. Aerodynamically, the 4C Spider body shape offers the same downforce as the coupe version, which is important for high speed stability and special attention was paid to minimize cockpit wind buffering for passenger comfort. 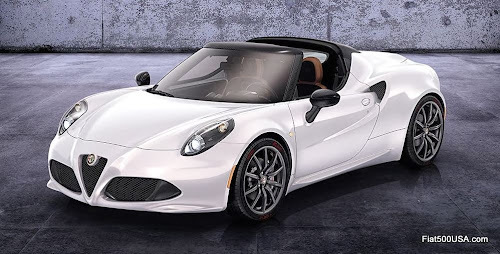 Other design details of the new Alfa 4C Spider are a carbon fiber windshield frame and roll-bar cover, different diameter alloy wheels front and rear (18" at the front and 19" at the rear), and a dual-mode central exhaust system complete with titanium and carbon fiber tailpipes. 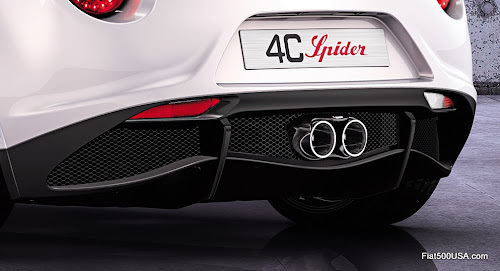 This system is made by Akrapovic, a well-known high end competition exhaust manufacturer and features a wireless controlled electrically operated valve that bypasses the muffler when so desired. 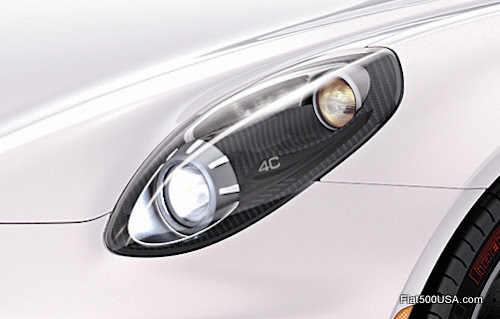 Finally, there is a new, attractive headlight design that we speculate may eventually show up on the coupe version, too. The Alfa Romeo 4C will make its North American debut next month at the New York Auto Show. The 4C Spider may or may not be on display, but rest assured we will have plenty of images and details on whatever car is at the show! Great job Chris!! Fiat500USA is always out front, leading the way in fine reporting of Fiat and Alfa news! Thanks for the visiting and the kind words!